The historical inflation rate has gone from a negative to a sharply higher positive in the last quarter of 2009. In the last 2 months of 2009 inflation spiked from a negative .2% to a positive 1.8% for November 2009 and in December it was 2.7%. In just 2 short months the inflation rate of a .2% negative changed to a positive 2.7%. If you are a person who is concerned about high inflation because of the Federal Reserve pumping trillions of dollars into the US and the world banking system then it’s time to pay attention. Here is a chart of the historical inflation rate that goes all the way back to 1901 and up to December 2010. 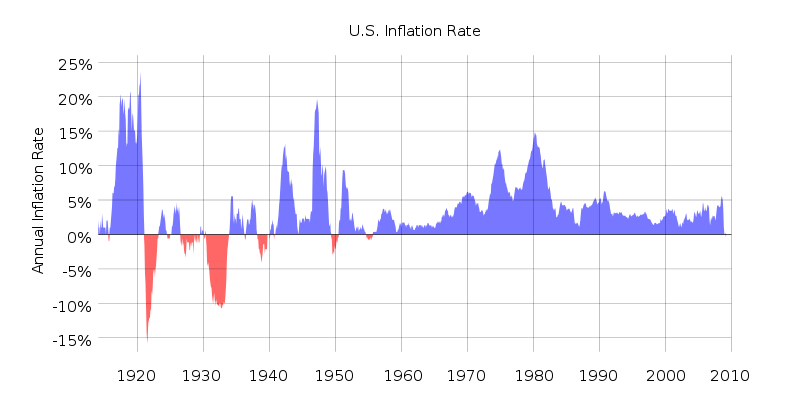 In this chart you can see the historical inflation rates that we have had very high inflation within our own history. For most of 2009 the historical inflation rate was negative at -2.1% then suddenly in December that entire negative disappears in just 2 months to a positive 2.7%. What will this mean for 2010? Why high inflation will be the result? The amount of money the Federal Reserve is putting into the banking system is unprecedented. We are in uncharted historical dollar amounts. A person in the business of forecasting the economy usually only looks a one thing. They make a decision based on that one thing. Like the money supply in the banking system for example. There’s a problem with the one thing, there’s a lot more going on than the more than doubling of the money supply in the banking system. Then we have the more than doubling of the money supply from $800 billion to 1.8 trillion in the banking system. We add this all to the 1.4 trillion deficit spending by the federal government for 2010. Then we need to add another $174 billion for a so called jobs bill that only has $35 billion in it for jobs in infrastructure rebuilding , the rest goes to the states to make up for shortfalls in state budgets. This is not in the congressional budget office’s figures because the senate has not passed it as of January 30 2010, but the senate will pass it. This brings the total deficit so far to 1.57 trillion for the year 2010. This is all creating money out of thin air. We do have some historical president for a banking system collapse that took place from 1988 to 1995. But the total cost of that bank bailout was $500 billion over a 7 year period not 4 trillion over a 2 year period. So where does this lead to from this point. There are two periods in the Historical inflation rate were inflation got as high as 18% and even 20% but the problems that we have are many times larger than anything in the Historical inflation rate even when inflation adjusted. There’s another problem with the Historical inflation rate numbers reported by the government. It never seems to be in sync with the real cost increases that we experience in our weekly and monthly expenses. Here are a few examples. Some of the largest for 2009 would be the cost of gasoline which at its lows back in January was $1.60 a gallon now it’s 2.70 a gallon that’s a 60% increase in price in 12 months. Then there are commodities when taken as a basket are up year over year average of 15% for the last 10 years. Even this year copper was $1.50 a pound and it is back up to $3.50 a pound. That’s an increase of 130%. The cost of energy in 2009 has gone up between 10% and 30% depending on where you live. In my state there was a 10% increase and in Florida there was a 30% increase. Then the government tells us inflation was negative - 2.1% for most of 2009. How does that figure in? The math just doesn’t work out and it never does. There is something really wrong with the Historical inflation rate and the way Federal Reserve figures and what things really cost in the real world. I always said these guys are living in a fantasy land. Most Americans don’t have the luxury of paying their bills with fantasy land money. If the Federal Reserve believes there own phony Historical inflation rate to determine what to do with monetary policy, we are guaranteed to pay a very heavy price for there miscalculation. This price will be a severely devalued currency over the next 2 years. I believe the path we are on will lead to hyper inflation by the end of 2011 and escalate into a currency collapse in 2012. I think it will be a really bad currency collapse that will lead to a totally worthless dollar. You can’t dump $4 trillion into a monetary system without severe consequences.